I often look at my children as they continue to get older and feel deep heartache over them losing more and more of their “babyness” each day. I don’t know if all moms feel that pain as deeply as I do or if it affects me more than most, but watching the days of when they were itty bitty fade is truly difficult for me. I often worry that these are the “good ol days” and that the future can’t possibly be as sweet as these early years of their childhood have been. I’ve been struggling with that heartache a lot this last year. Recently though, I felt The Lord earnestly pursuing me through a simple visit from 2 preteen boys. My husband and his friend were speaking on the phone and he mentioned that his wife is out of town and that he was called in to work and didn’t know what he was going to do with their boys. Without hesitation Kraig offered to pick them up and bring them to our house- the house that we can’t currently enter because of the contractors here doing construction. But, that didn't stop him from offering to help a friend. He knew we could make it work. And The Lord knew He could use it to speak to my heart. The boys are 10 and 12. They aren’t little boys anymore who find joy with a toy dump truck like Colton does. I wondered what they’d think of being here. Would they be bored right away? Would they think a place without a screen to watch was a place worth being? Quickly though, I realized maybe these big kids weren’t as different from my little ones as I thought. From the moment they jumped out of the truck they were a joy to be around! 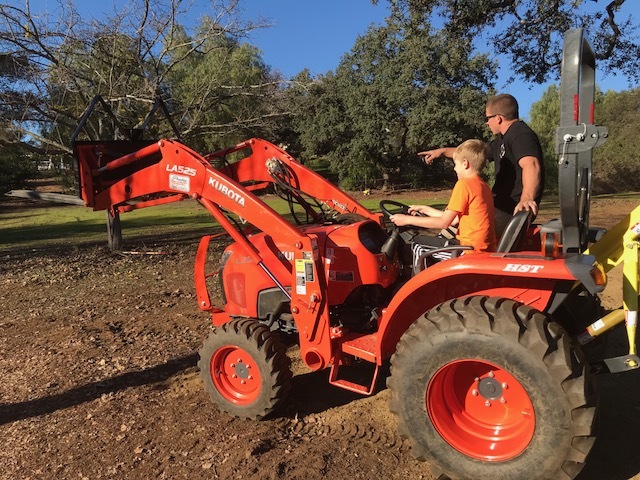 They eagerly wanted to climb the trees, play football, learn to drive the tractor, and pick and eat oranges right from the tree. We never would have been able to give them those experiences if we would have stayed in our last home. We never would have been able to welcome them so easily, even without a house to enter. It was incredible to watch our kids alongside these bigger kids all enjoying the same things- being wild and free! Around the dinner table (at chick-fil-a, no table here currently!) their conversations were witty, funny and engaging! I sat there listening and talking to them thinking about how neat it was to be in this moment with them. It gave me a glimpse of what life with my 2 will be like as they get older. Instead of being saddened by it I was shown that it can be filled with fun and sweet memories, too. Their bodies might be bigger and their independence greater, but they still get excited for simple things like an ice cream cone after dinner! I think my heart will always feel the heaviness of how quickly the days pass, but I am grateful for gentle reminders that I don’t need to live mourning the past or with apprehension about the years to come.